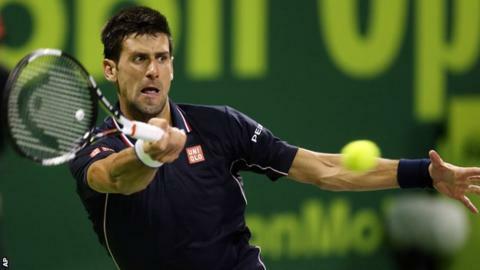 World number one Novak Djokovic made short work of his second-round match against Sergiy Stakhovsky at the Qatar Open in Doha on Wednesday. The Serb, top seed for the tournament, only needed 61 minutes to despatch his Ukrainian opponent 6-2 6-1. In the quarter-finals, he will face seventh seed Ivo Karlovic of Croatia, who overcame Georgian qualifier Nikoloz Basilashvili 7-6 (7-3) 6-3. Other seeds through are Tomas Berdych, David Ferrer and Richard Gasquet. "I have never played here before but I shall definitely be coming back next year," said Djokovic. Having pulled out of the Abu Dhabi exhibition final last week with flu, he added: "I'm feeling better." Karlovic's straight-sets win included 17 aces, and his career total of 9,041 is now only bettered by former American player Andy Roddick (9,074) and fellow Croatian Goran Ivanisevic (10,183). Defending champion Rafael Nadal, the world number three, had went out in the first round on Tuesday. His conqueror, qualifier Michael Berrer, subsequently lost out to Ivan Dodig in round two, losing 7-6 6-2.